Green Man Gaming, the new digital retailer due to be unleashed in April and Sony DADC have entered a groundbreaking deal to integrate Sony DADC’s world leading SecuROM Digital Rights Management solution into Green Man Gaming’s revolutionary digital retail platform. SecuROM is widely used by 90% of major games publishers including Electronic Arts, Take2, Capcom and Ubisoft. 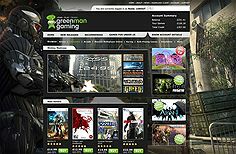 Green Man Gaming is an independent digital retailer for PC games based in the UK. Green Man Gaming is working with retailers, etailers, social networks and media companies to bring PC gaming to a wider audience through a user centric and innovative digital solution.